Discussion in Toys, Kids & Baby Stuff started by Jasmin Cottontail • Nov 20, 2016. 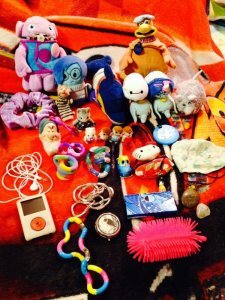 I was wondering what toys are best for children with autism? Especially with non-verbal autism. I have a brother who has autism and he is 12 years old. He is non-verbal. And I've been looking for toys that can help him enhance his mind as well as his communications skills, and where to buy them. Thanks! Not just children but I guess even grown ups who have autism like to stack things up or build things, aside from that, most of them love to do art, like painting or drawing. So I suggest starting with LEGO or a paint app in an IPad so it would be less messy for you if he would want to do some art. When my nephew was diagnosed with autism, we were somewhat devastated because we thought that we had to deal with a huge abnormality. Fortunately, we discovered early (when my nephew was 3 years old) that he was fond of the cellphone. It was not a smart phone yet but he loved the games especially the phone games with sound effects. When the smart phone went in fashion, my brother bought one for his autistic son and later on it was the tablet. I can say that the gadget is the best toy for an autistic child. Instead of spending for the therapy which has no real effect at all, just buy a good gadget that your autistic child would truly enjoy. By the way, my nephew is now an adult and his hobby is to watch videos on youtube…. using his phone. I haven't seen anything like LEGO yet aside from those bigger versions of them which are fake and do not stack pretty well. Just let him play with the IPad for the mean time if he enjoys it. Just don't let him get stuck with it though. @Alexandoy Yes I agree. Gadgets can also be a good help not only with normal people but also for people who have disabilities, like autistic people. My brother used to go to therapy before but all we did was spend because he never learned anything. I guess it also depends on which school and the teachers. But even so, we're still planning to enroll him in a Speech therapy hoping he could still talk. As of now, he's fond with his iPad. There are a lot of apps that he is fond with particularly games, puzzles and drawing apps. He also like watching videos on YouTube So I guess we'll stick to it for now. @Working Buck My brother have big Legos and yes they don't actually stick together, that's why he always gets annoyed every time he plays it. Right now he is fond with his iPad and I guess he is learning bit by bit through these apps that he is playing. He loves puzzle and drawing apps, he even play games wherein before he had no idea how to navigate it. I can't say that everyone with autism will like it, but maybe you could buy him stim toys as well? Stim is short for stimulation, which means the person repeats an action and with stim toys they can find relieve/enjoyment from using it. Some examples of them are slime, chewable accessories, small movable gadgets or even a stuffed animal to pet. Technically, if you get some sort of toy that has a constant repeated action involved it can count as a stim toy. The image I linked shows more types of stim toys as well. I hope this can be useful for you! There is a contact click as well as you can find them at twitter too. I hope this helps and you're welcome in advance. Take care. To be honest I am not sure that these existed before, but lately I found out that these fidget spinners are made for children with autism. I was shocked. Because what I saw, fidget spinners were used by every single person on the streets, and then I found out that it was made for children with autism and I was confused. Why would people then use it so much if they don't have autism. I tried the thing and I don't really see the point of it, nor how it helps. But who knows maybe it really does.